Hodad’s owner Mike Hardin. Courtesy of QSR Magazine. 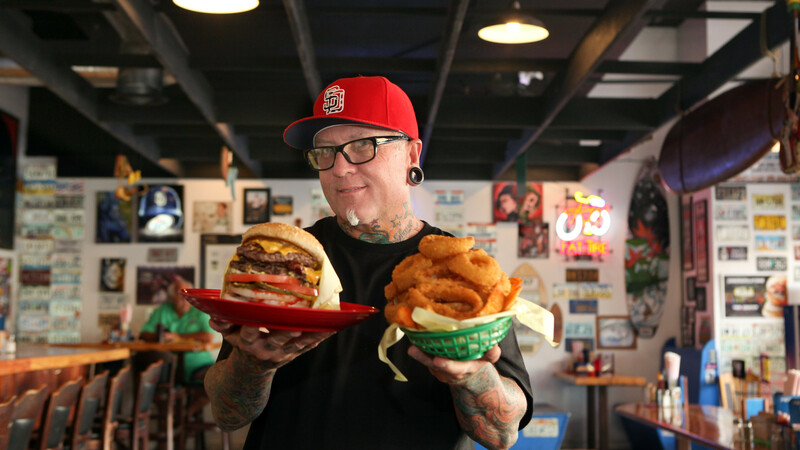 Both locations of the iconic San Diego burger joint Hodad’s were temporarily closed Friday following the death of owner Mike Hardin. The Ocean Beach and downtown eateries will be shut down until Sunday at 11 a.m., according to the restaurant’s website. Mourners were leaving flowers and cards outside the Ocean Beach location at 5010 Newport Ave.
“The Hodad’s family is completely devastated by the news of Mike Hardin’s untimely passing,” a note on the website said. The parents of Hardin, 56, opened the original restaurant in Ocean Beach in 1969. He became a neighborhood fixture and was known as “Bossman,” which he had tattooed onto his knuckles. Hodad’s added the downtown location on Broadway at 10th Avenue several years ago, and now runs a concession at Petco Park during the Padres season. While well-known locally, Hodad’s gained national attention in 2007 when featured on “Diners, Drive-ins, and Dives” on The Food Network. Madera County sheriff’s Lt. Bill Ward said Hardin’s body was found in the Central California town of Chowchilla on Thursday. Hodad’s was already planning to be closed Saturday to celebrate the life an employee, Kyle Witkowski, who killed in a car crash last month.